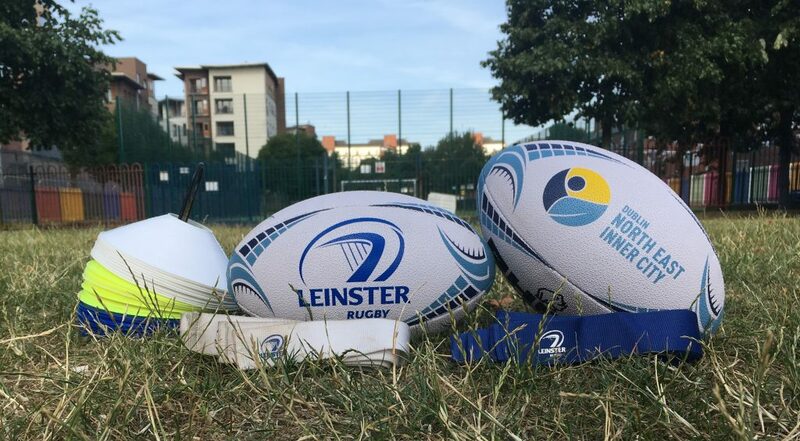 Since September, schools in Dublin’s North East Inner City have been taking part in Leinster Rugby and Dublin City Council’s Tag Rugby programme. This programme is designed around the principle of broadening both interest and participation in the game of rugby. On the back of such a successful programme in the schools, Dublin City Council and Leinster Rugby were delighted to launch the start of a new mini rugby club in the Inner city area. The ‘North Wall Lions’ is run by Leinster Rugby, and is all about ‘Giving Rugby a Try’. Since the launch of the club in early November, the numbers have grown, and there are now over 60 children learning to play rugby every Monday afternoon. The game encourages the build-up of running and handling skills, while the ultimate objective is for players to enjoy themselves. The players will learn the skills of catching, passing, evasion, discipline and teamwork. If any schools or youth clubs in the North East Inner city or Central area would like to participate in the tag rugby or any other Leinster Rugby programmes please contact your local Community Rugby Officer.